A University at Buffalo-led study has proposed a new method for accurately tracking a 3D printed object back to the machine it came from. Called ‘PrinTracker,’ the new process could help law enforcement and intelligence agencies track 3D printed guns, counterfeit products and other goods. “3D printing has many wonderful uses, but it’s also a counterfeiter’s dream. Even more concerning, it has the potential to make firearms more readily available to people who are not allowed to possess them,” said lead author, associate professor Wenyao Xu. 3D printers move back-and-forth while printing an object. Instead of ink, a nozzle discharges a filament, such as plastic, in layers until a 3D object forms. Each layer of a 3D printed object contains tiny submillimeter wrinkles called in-fill patterns. These patterns are supposed to be uniform. However, the printer’s model type, filament, nozzle size and other factors cause slight imperfections in the patterns. The result is an object that does not match its design plan. Like a fingerprint to a person, these patterns are unique and repeatable. As a result, they can be traced back to the 3D printer. To test PrinTracker, the research team – which includes coauthors from Rutgers University and Northeastern University – created five door keys each from 14 common 3D printers. With an inkjet scanner, the researchers created digital images of each key. From there, they enhanced and filtered each image, identifying elements of the in-fill pattern. They then developed an algorithm to align and calculate the variations of each key to verify the authenticity of the fingerprint. 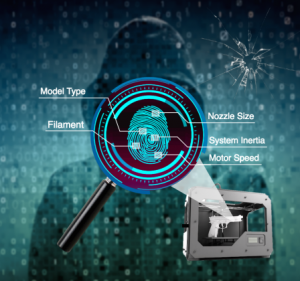 Having created a fingerprint database of the 14 3D printers, the researchers were able to match the key to its printer 99.8% of the time – even 10 months later! The team also ran experiments involving keys damaged in various ways to obscure their identity. To their delight, the PrinTracker proved to be 92% accurate in these tests.